We get to know our favourite new musical maximalist, Hush Moss. The music world is hardly short on talented nostalgia-peddlers, but Berlin-based Hush Moss is unique in that he’s willing to go that little bit further to tap the silky sounds of yesterday into something deliriously loveable. 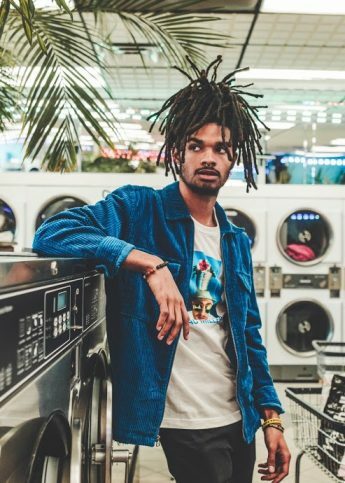 Somewhere between funk-inflected R’n’B and sheer pop brilliance, Hush Moss gave the world a taster of what to expect from his upcoming debut, It Takes A Lot, when he dropped the record’s title track earlier this year. Laced with the kind of retro sax work that would make Bobby Caldwell proud, it’s a smooth-as-butter number that seductively channels early 80s sleaze with a wink-and-nudge aplomb – something similar could also be said for recent release “Take Me By The Hand”. Now, In other words, it’s the kind of music you can’t help but simply enjoy. Still, that apparent simplicity belies the varying textures and attention to detail Hush Moss brings to bear on his work; those woozy guitar licks, spaced vocals, and shimmering synths don’t just pull themselves together with an easy charm by themselves, you know. With the LP penned in for a mid September release, we got chatting to the man behind the the music – and no, while we would like to imagine he’s wearing crocodile loafers, he probably isn’t – to talk songwriting, the creative process and why Charlie Wilson is his dream co-conspirator. You’re based in Berlin – what’s the music scene like there and how does it inspire you? It’s very diverse. In general, bands take care of each other, collaborate, promoters are very supportive, there’s the space to grow. It gets inspiring when i discover new music I like which is based here, cause I can try to follow and relate to it easily. How did you get signed to Average Negative? Chrisi Chris played drums with us in our first Berlin show and that’s how I also met Jian. I remember they were into it. We signed half a year later, when it was better for both of us, I guess. They are the label but first my good friends and I love them. Tell us about “It Takes A Lot”? What can we expect? What themes does it explore? Tell us a bit about its conceptual narrative? It was produced by Doctor Captain Richard Malone Beef and his best man Young Yosef. First of all, I think we wanted to create something that was new for us and also something that feels luxurious but is ideally simple. It mostly explores intimacy & insecurities. The album features amazing friends and some of the most expressive musicians I know, so even though it happened like a year and a half ago, I feel close to it. Your sound is very unique – what’s your writing process like? Thank you! Its helps me to have a deadline when I write, so I kinda wrote it in a month and kept little demos of basic ideas and parts. When we got in the studio the sound was nourished by Beef, we took it step by step and had fun. Who are your influences and is there a particular era you look to? I have too many to mention but lately Madonna, Frank Ocean, Kraftwerk & DJ Pearly Balls. I look to all eras, for sure. Who’s your dream collaboration and why would you love to work with them? Charlie Wilson would be amazing. He’s a legend, I wish we could form a band together and only play the song Outstanding! Pre-order It Takes A Lot here.